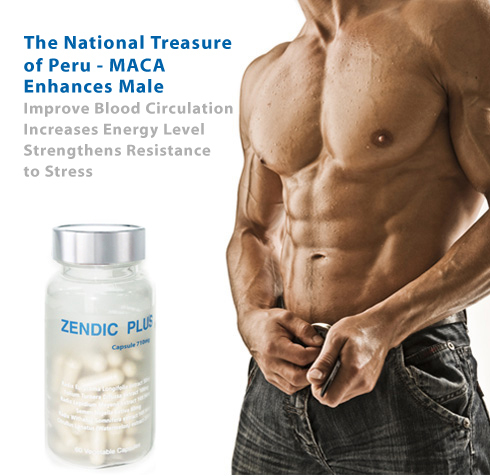 Zendic Plus is a premium men's health supplement consisting of a special formulation of natural ingredients for maximum effectiveness. Zendic Plus includes extracts of Maca (Lepidium Meyenii), Tongkat Ali (Eurycoma Longifolia), Fennel Flower (Nigella Sativa), Indian Ginseng (Withania Somnifera), Damiana (Turnera Diffusa) and Watermelon (Citrullus Lanatus). Many of these herbs are renowned in their native areas for their potent aphrodisiac and other medicinal qualities and have been extensively used in local traditional medicine. Zendic Plus combines all six herbs in its uniquely designed blend which boosts sexual ability, increases strength and energy levels, fortifies the immune system and improves general well being.